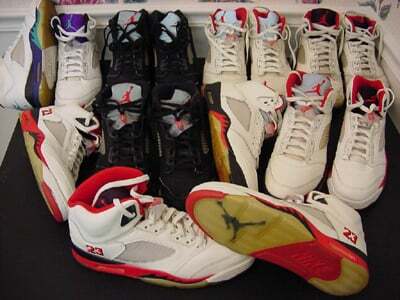 The Air Jordan 5 was released in February 1990. Four models of the Air Jordan V was released to the public. Two models which are the Black/Black-Metallic Silver and White/Fire Red-Black had MJs number “23” on the side. Limited to only 100 pairs each, and were given to unfortunate kids or auctioned off as charity. The Air Jordan V was the first in the Air Jordan line to have a clear rubber sole. Tinker Hatfield also designed the Nike Marty MacFly’s featured in the movie Back to the Future II, they had clear molding which allowed light to come through, and that is were Tinker got the idea from. 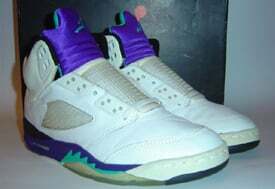 Also the AJ 5 was the first time anyone had ever molded foam into a shoe upper. When you look at the AJ V besides the icy soles, what else do you notice? What I notice is the flames on the side. Tinker came to the conclusion that the way Michael performed was “like a Fighter Plane”. 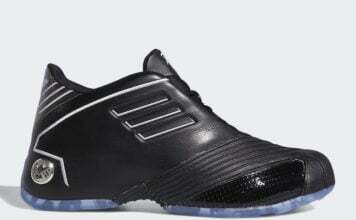 When the AJ 5 was designed, the inspiration was “grey nurse shark” or Super marine Spitfire MkVIII, which is a World War II British fighter plane. To add to the finishing touches of the shoe, Tinker added a reflective 3M tongue with Jumpman embroidery. 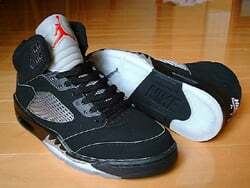 When the Air Jordan 5 first came out in 1990 they retailed for $125.00. In 2000 when the AJ V made its second appearance they sold for $120.00. 2006 Jordan Brand will re-release the Air Jordan V once again, but this time with a $135.00 price tag.